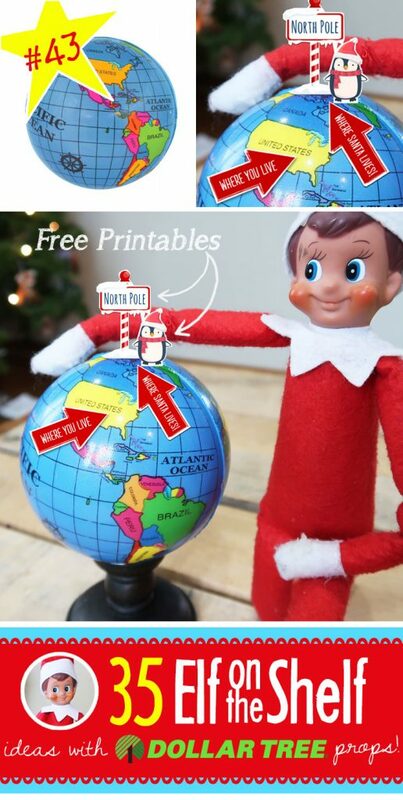 New Elf on the Shelf idea: So where exactly is the North Pole compared to where you and your family live? Elf wants to show the kids!!! Use the free printable arrow to show where you live. And then use the other arrow and decorations to show where the North Pole is. We set the globe ball (from the Dollar Tree) on a candle stick as a stand. Be sure to cut out the flaps on the bottom of the penguin and North Pole sign so that you can make them stand up straight. You can use tape, glue, or like I did, a thumb tack, to hold the sign and penguin in place. Don’t let it seem intimidating, it is super easy! Just print out the free printable using the link below. Cut out each piece. Tape the arrows on and then put the sign and penguin in place, and voila! You’re done in five minutes or less! !